Gorgeous as always! i love the horizontal aloe. Intended or not, it really makes the arrangement sing. Thanks Peter. I guess that aloe knew which way it needed to sit. I agree with Peter I think the horizontal Aloe really makes the arrangement and so is the most important element. I think it is one of my favourite arrangements. Glad you like the arrangement Christina with the aloe. 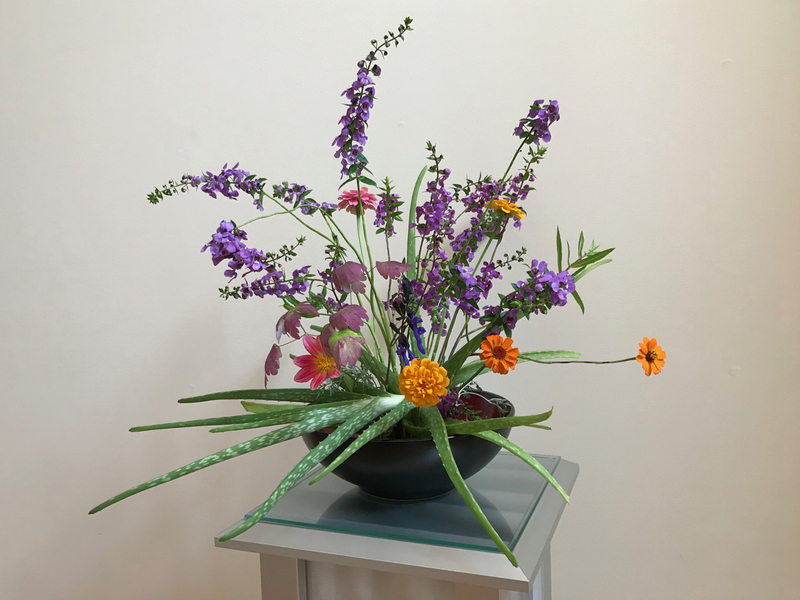 I think the aloe worked well to bring an element of surprise. I like the way you have built this up Susie and agree that the aloe looks just right in a horizontal plane . Each consituent part is such a rich colour, making a warm vase overall. And do tell us why you have to have the aloe nearby in the kitchen – do you use it on cuts and burns? Thanks Cathy. Yes, the aloe has rescued me many times through the years when I’ve burned myself. Never thought to try it for cuts though. Still a successful display if not what you originally had in mind. I must watch my Aquilegia and see if the leaves color up. Yours are lovely. Linda, all of my Aquilegia except this one is still green. I love it at this colorful stage. Nice use of the Aloe! And you should be able to replant it when you dismantle the arrangement. Succulents are so wonderfully accommodating. Thanks Kris. There’s no root on the piece of aloe, but I think it should root. Aloe is one of my indoor plants I always want around. Mine doesn’t bloom like those I saw growing in yards in CA though. Inspired use of the aloe. I’m not surprised it is one of your favourite arrangements – a triumph! Well, thanks so much! The aloe was interesting to use. I may try it again with other flowers. Ooh, interesting! 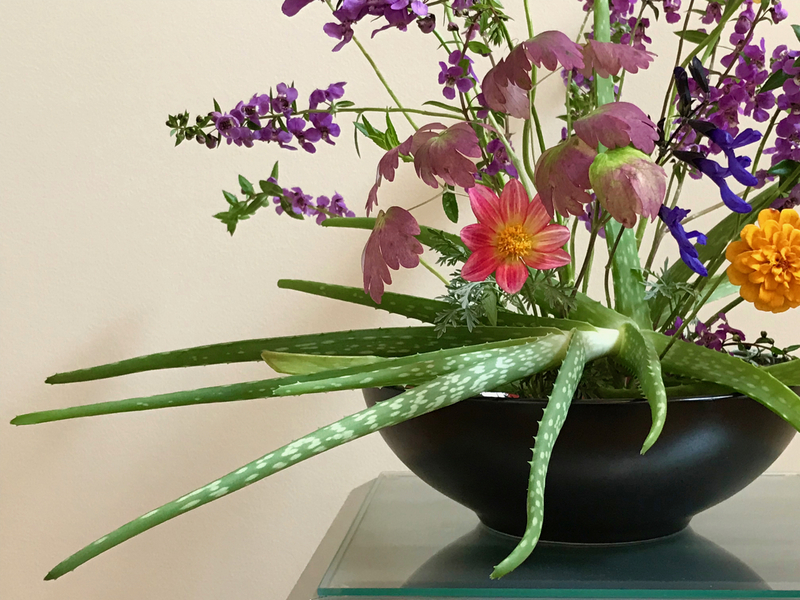 The aloe is a great start and I love the contrasting colours of flowers you’ve used as well. Thanks Alison. The aloe was a nice architectural material to work with this time. Must look for more things like it to use. Good to know that even with your apparent control your arrangements evolve. 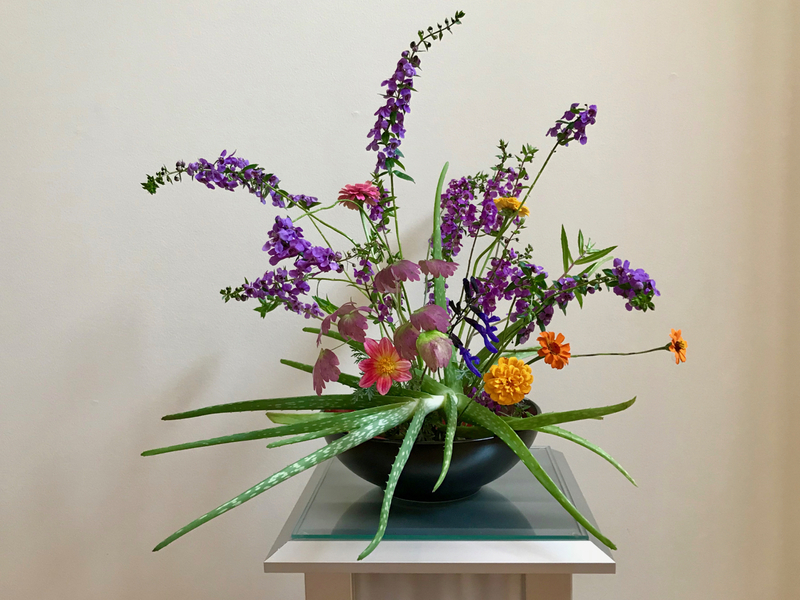 The Aloe is the most startling element so it still steals the scene. Oh, I’m seldom in control of my arrangements. 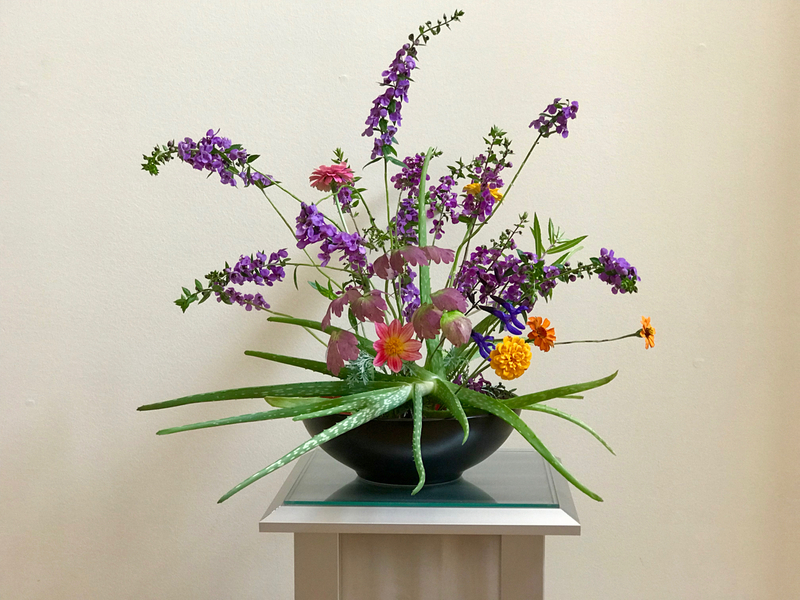 Was telling a friend today I couldn’t work in a florist where I had to duplicate a design time after time–mine just lead and I follow. Hope you’re doing well. Beautiful colors, Susie, and the aloe is so striking. Very clever of you to use it in an arrangement! Thanks Eliza. That aloe had been getting too large and I’d noticed its shape caught my interest every time I watered it. Glad I decided to include it in a vase. Well if we were closer you could have this one. 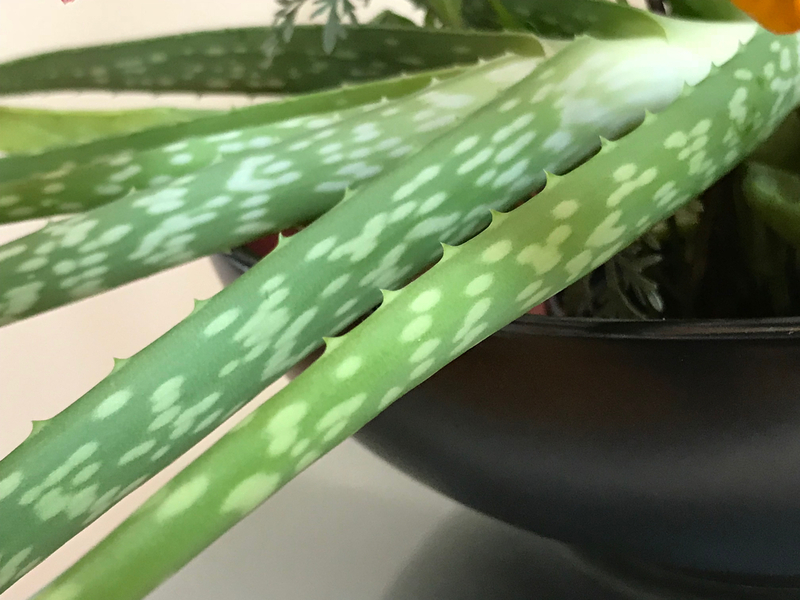 I do like having an aloe in the kitchen. They’re really useful for burns. Take care Beth! 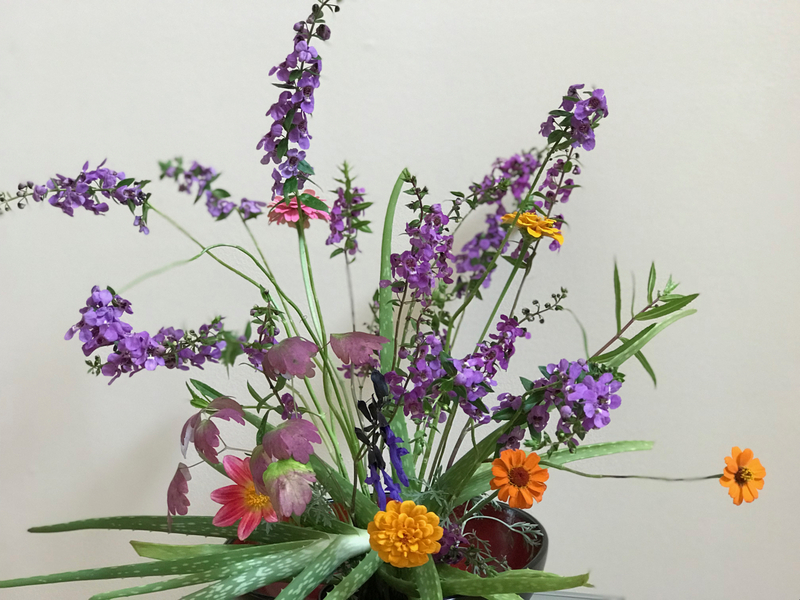 The zinnia is beautiful, and I love the way the aloe is arranged horizontally – even if it was unintentional! Thanks Cathy. 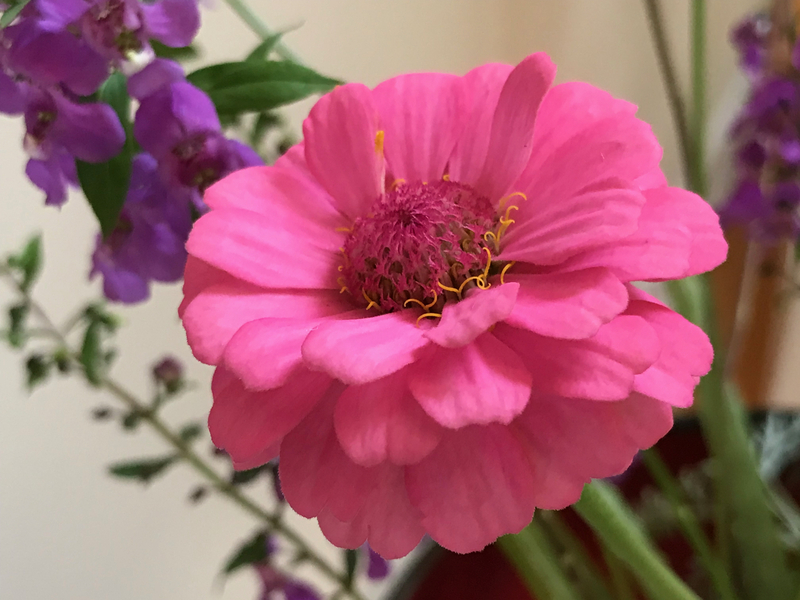 The zinnias have been great this summer but days are numbered—‘til next year. 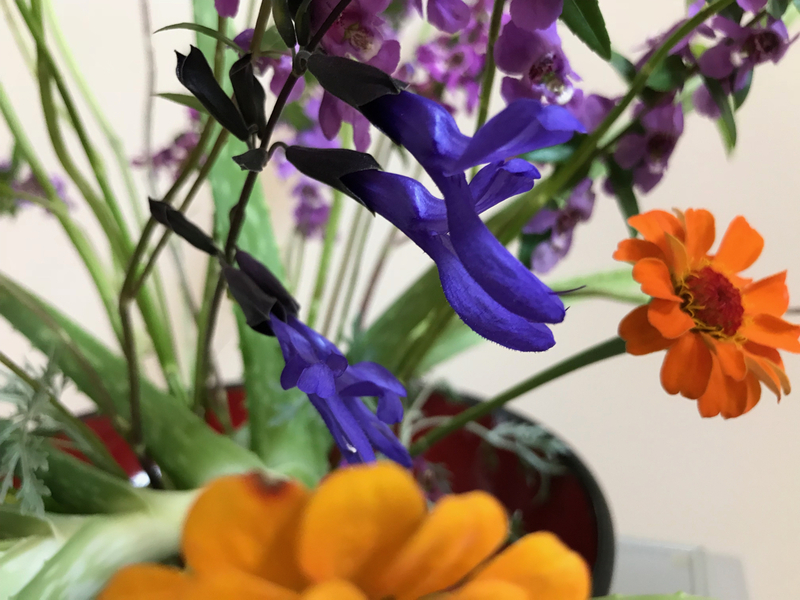 Purples and blues are my favorites in the garden and a bit of orange can really make them pop. I think I mostly like orange in the heat of summer; once we get into traditional pumpkin time it’s too much! No pumpkin vines around here so that’s not a problem!